Did you know? It was my birthday last May 12, 2013. I was so into the long weekend and to the elections that I have not informed you about it. I should be posting wish lists or things I want to happen because I just turned freakin 23 years old last Sunday but I am too darn lazy. A lot of things are bothering my mind right now. Random stuff like why I am here in this world, why am I so pretty, why do I like eggs and why it makes me fart. Hahahaha I kid. The truth was it is so hot in the Philippines I can’t concentrate. I was also busy thinking of what should I do on my 4th year blog anniversary. I am thinking of ways to make my readers happy. Moreover, I have a blessing in disguise! Apphia Forever is an online shop that sells affordable Korean clothes in a reasonable price. 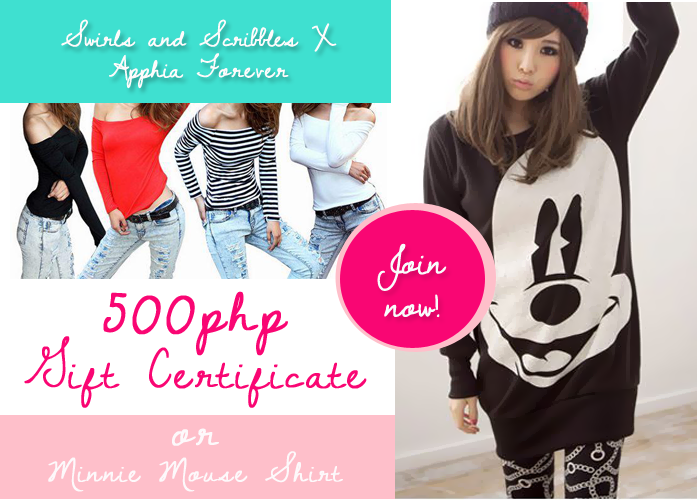 Here’s the catch, they are giving away 500php worth of GC and one (1) minnie mouse shirt. It is the cutest! How to join? You know the drill. Wait for rafflecopter to load and like, follow, tweet, share and reblog. Easy as that! There will be two (2) winners for this contest. For Philippine residents only. Best of Luck!